Two sample breakout stocks for Week 9 with better than 10% short-term upside potential. Two Best of the Dow 30 for mega-cap selections this week based on breakout model characteristics are: Pfizer and Microsoft. Continuing from last year now makes it 79 out of 93 trading weeks (84.95%), with at least one stock move 10% or greater within a 4 or 5 days. Total returns for the breakout stock selections since 2017 is 74.53% compared to 19.30% for the S&P 500 over the same trading period. This week 3 out of 4 breakout stocks for members reached double digits during a short trading week. Selling of the breakout stocks prior to the end of the fixed 4- or 5-day holding measurement period remains the most profitable 1-week strategy. 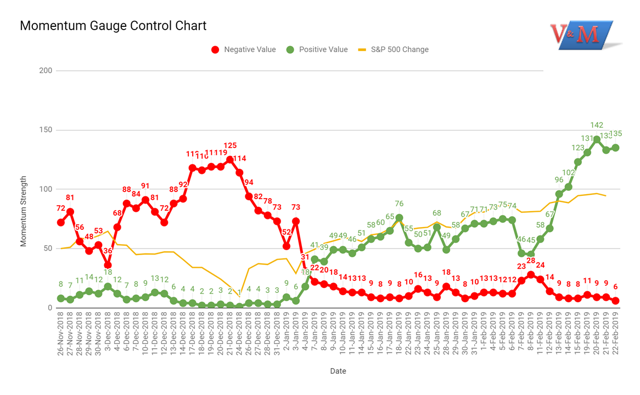 Also, as I monitor results for optimal holding periods over multiple weeks on the breakout stock spreadsheet for members, I am seeing that the two-week hold through the following Thursday is currently generating the best overall results as positive momentum conditions carry well into second and third weeks. The evidence is strong that you can outperform the fixed 1-week, equal weighted minimum return measurement shown above in the 1-week close (blue line). Selling many of the selections prior to Friday has resulted in +61.60% return YTD (green line) compared to the S&P 500 +11.51% for the same period. 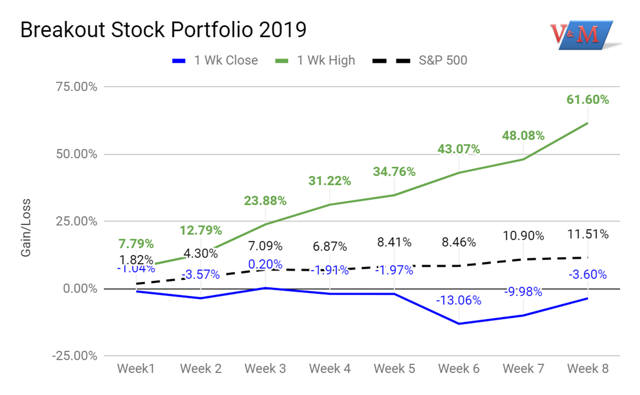 As the returns for the past 8 selections for 2019 show, so far, the best returns were generally achieved in fewer than four days with an average top gain of 9.26% per stock. Idiosyncratic events will occur that the model cannot anticipate (e.g. earnings surprise, CEO resignation, SEC investigation, etc. ), so it is always a good strategy to hold a basket of stocks to diversify unpredictable risks. Momentum conditions remain strongest among AcelRx Pharmaceuticals (ACRX), Earthstone Energy (ESTE), PPDAI Group (PPDF), Insys Therapeutics (INSY), CymBay Therapeutics (CBAY), Cara Therapeutics (CARA), Patterson-UTI Energy (PTEN), Marinus Pharmaceuticals (MRNS), Aqua Metals (AQMS), TechTarget (TTGT), FormFactor (FORM), Keane Group (FRAC), eXp World Holdings (OTC:EXPI), Barnes & Noble Education (BNED) and Daseke (DSKE) from prior week breakout selections. Momentum parameters have moved highly positive from Week 8 Breakout Selections. For Week 9, the four breakout selections took off on Friday before the market close for members who jumped in early with exclusive advance notice. The four breakout stocks to start the week consist of 2 healthcare and 2 technology stocks. Feb-19-19 07:18 AM Akebia Therapeutics, Inc. Is Trading At A 29.34% Discount Simply Wall St.
Akebia Therapeutics, Inc., a biopharmaceutical company, focuses on the development and commercialization of novel therapeutics for patients with renal disease through hypoxia-inducible factor (HIF) biology. Its lead product candidate is vadadustat, an oral therapy, which is in Phase III development for the treatment of anemia due to chronic kidney disease in dialysis and non-dialysis patients. Jan-31-19 01:03 PM Does Qudian Inc. Have A Good P/E Ratio? Simply Wall St.
Qudian Inc. provides online small consumer credit products in the People's Republic of China. It uses big data-enabled technologies, including artificial intelligence and machine learning to transform the consumer finance experience. The company offers cash credit products, such as cash short-term unsecured lines of credit, which are distributed in digital form, and merchandise credit products to finance borrowers' direct purchase of merchandise offered on its marketplace on installment basis, as well as budget auto financing products. Heading toward a new 52-week high above $115/share with indicators showing strong momentum to break $112/share key resistance to October. Breaking above a negative price channel on strong earnings and positive technical indicators. Headed to $48/share to new 52-week high on strong earnings and top of the positive price channel. All of these key weekly and monthly selections feed into the Premium Portfolio database selection model portfolio that is now up 22.34% YTD with 22 stocks gaining more than 10% and as much as 66.21% since January. Disclosure: I/we have no positions in any stocks mentioned, but may initiate a long position in AKBA, QD, MSFT, PFE over the next 72 hours. I wrote this article myself, and it expresses my own opinions. I am not receiving compensation for it (other than from Seeking Alpha). I have no business relationship with any company whose stock is mentioned in this article.